Has life in another star system contacted Russia? 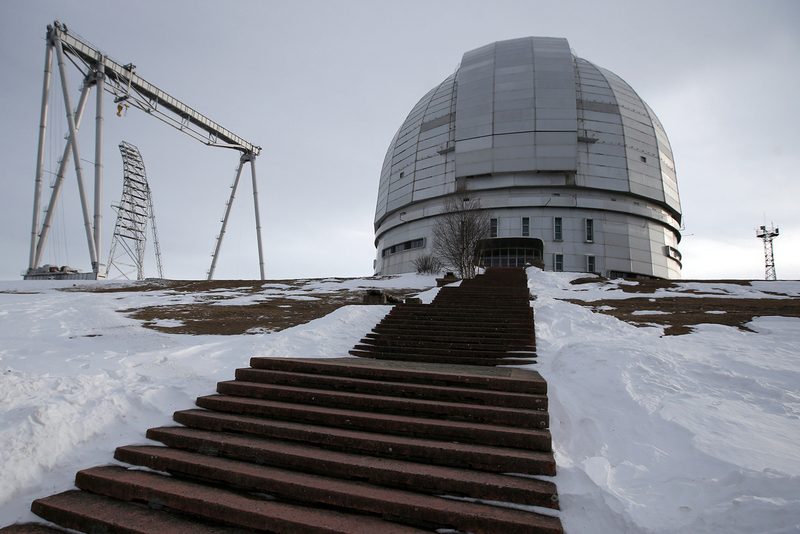 The Special Astrophysical Observatory near the village of Nizhny Arkhyz. A mysterious signal has been detected by a radio telescope operated by the Russian Academy of Sciences' Special Observatory in the North Caucasus. Scientists in Europe and the United States think there could be life in the HD164595 star system in the constellation of Hercules. So why have Russian astrophysicists hidden their discovery for over a year? What is their theory about the signal's origin? The radio signal detected by the Russian telescope RATAN-600 on May 15, 2015 was highly unusual in terms of its strength, with a wavelength of 2.7 cm. The radio session lasted two seconds, which is very long for this type of signal. Waves emanating from the Moon, for example, are seven to 12 times weaker. "First, we checked if there were satellites in the area where the telescope found the signal, but everything was clean," said Ekaterina Filippova, head of the scientific information department of the Russian Academy of Sciences' Special Observatory in Nizhny Arkhyz (in the North Caucasus, 900 miles south of Moscow), in an interview with RBTH. "It could be interference from military facilities or passing aircraft, but perhaps the signal came from the star system under study." HD164595 is similar to our solar system. Its distance from Earth is 95 light years. Scientists have been constantly monitoring this system for over a year, especially of a "hot Neptune" planet similar to the Earth in composition but 16 times greater in mass. Both Russian and Western scientists working on the SETI (Search for Extraterrestrial Intelligence) project believe that life is unlikely on this planet. Therefore, Russian scientists did not consider their discovery to be important and reported it only last week. They did not anticipate that it would generate huge global interest. Is there life on 'Earth-2'? The scientists who made the discovery tend to favor the theory of the signal's earthly origin. "Such interference happens up to 50 times a year, and there is nothing peculiar about this," said Oleg Verkhodanov, a senior astrophysicist at the observatory in Nizhny Arkhyz that discovered the radio wave. "The RATAN telescope works with frequencies that are not used in Europe and America, and the signal was detected in their range." Another theory proposed by Verkhodanov is so-called "random noise." These phenomena have been discussed in the scientific world for the past two years – when for unknown reasons a natural surge of waves occurs. "The surges are possible, for example, when an asteroid falls onto a neutron star, and these kind of signals emerge as a result," Verkhodanov told RBTH. "Well, a `Hello' from extraterrestrial civilizations is the last theory on my list." The discovery of the signal from HD164595 is already one of the main topics for discussion at the annual meeting later this month of the SETI Permanent Committee. It's still not clear what exactly will be discussed at the meeting because such powerful signals suggest a civilization much more advanced than Earth. According to astrophysicists, the signal could reach Earth only if it was specifically directed at us. In addition, the frequency of 11 GHz where the radio wave was caught belongs to Russian armed forces. The militaries of other countries do not use it. "The search for extraterrestrial civilizations has been going on for over 50 years, and our radio telescope is the world's largest in its class, and is able to find even the weakest signals," Filippova said.